more than just the cost. All air systems. 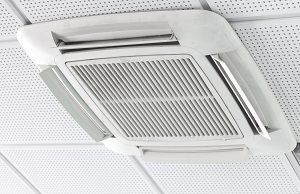 These transfer the cooled air through a series of ducts in the ceiling and air is distributed via grilles to each room in the building. Whilst this is the simplest system, it can be difficult to install, as large ducts are needed and controlling the air temperature is not always easy. Water based systems pump chilled water throughout the building which is distributed by a fan blowing air over the coils carrying the cool water. Refrigerant systems are also referred to as DX or Direct Expansion units. They operate a cyclical system using refrigerants that absorb heat when they are converted from a liquid to a gas. Different units can be placed throughout your premises offering great flexibility and control. These systems are also cheap to run and energy efficient. Variable Refrigerant Flow (VRF) has the benefit of being very flexible to install and having easy to use electronic control systems. By using different pumps these systems can provide heating and air cooling at different times or simultaneously in different areas of the same premises. Digital Inverter. A wide variety of digital inverter units are on offer, covering all kinds of commercial application, such as ceiling mounted, ceiling suspended or enclosed indoor units. This system offers a compact system with a low running cost. Portable air conditioning units are lightweight, easy to use and can be moved to wherever there is a need, providing instant air conditioning. Spot coolers. These can be used to cool a specific application or area in the building with a powerful stream. Evaporative Coolers are filled with water and operate via evaporation to provide a cooling effect. These are cost effective and work well in large, well ventilated areas.